In the little world of blogging there has been a "mini-movement" to show that there isn't this perfect lives of those who do blogs. It was started a normal lady who just wanted an honest to blogging experience with her readers. You can check out the first post HERE, if you'd like. I thought is was so clever, as did others, that even more popular bloggers started to jump aboard, like Creature Comforts and CocoKelly. Life isn't perfect and neither are we. Blogging, or even the internet, shouldn't allow society to put on a facade of perfect. We are people, and our mistakes shape us, even if they are dumb. 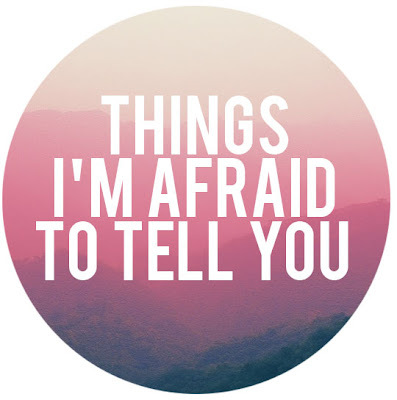 So, hang on tight, because here it goes: all honest, all uncensored things that I'm afraid to tell you. 1. I am just as insecure as the next girl. Of course, it was probably worse when I was younger. I have the same struggles with looks, weight, and intelligence like every person does. "Am I pretty enough?" or " Does this make me look fat?" but more often than not "Am I smart enough?" Everyone goes through this! And if you say you don't you are not being honest with yourself. 2. I carry on coversations with myself. And quite a bit, too. Sometimes I even have conversations about why I am talking to myself, and then I laugh because it's so ridiculous. I'm convinced that I probably talk more to myself than the average person. They are usually of conversations I might have or want to have, things I've should have said, hypothetical situations, or I'm giving a speech of some sort. I've probably even preached to myself, I'm not really sure, but I wouldn't put it past me. 3. I keep people at a distance because I am scared to be vunerable. I've had to work at this one a lot and I can say that I have improved, but there stil are times when I keep myself so guarded because I don't want to let people in. It is very hard for me to be vunerable, but now I have learned I shouldn't try to hold it all in, and the meaningful relationships that I make are there for a reason. 4. I am constantly checking my phone in the car because I am afraid that I might have called somebody on accident and they have heard me singing the whole way home. This still has yet to happen, but I don't want to let my guard down . You can never be too safe. 6. I have no idea what my future holds for me. This both terrifies me and excites me. Just recently my life has taken me from my comfort zone of Texas to Colorado. I could have never in a million years predicted that. I have never regretted the choice, and there still are times when I wonder what would have happened had I have stayed, but the unpredictability of life makes it an adventure. I want to be someone who always puts myself in situations that will allow my faith to grow. I don't want to be someone who sets myself up so well in life that I will never have to ask for God's help. Ouch! A few of those hurt- but it's honest! I don't have it all together, and I don't pretend to either.